Dee Oliver grew up in a wealthy environment, living in a beach front home in Virginia. After graduating from a private college, she lived at home, struggling to figure out both a career path and her love life. In the 1980's Dee met her future husband-to-be, Johnnie, when he contacts her after she catches his eye during a funeral. Johnnie is a fourth generation funeral director and his profession shapes their entire relationship, starting on the first date when he needs to leave a restaurant to pick up a body, bringing Dee along. The pair soon married and Dee found her life shift, as she became the mother to three daughters and helped out at the funeral home. When Johnnie unexpectedly dies of a heart attack in his early fifties, Dee is left not only mourning her husband, but trying to figure out a new direction for her life. 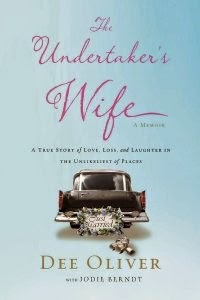 She decides to go back to school and get her funeral director's license, expecting to find a job at her husband's funeral home, which is being run by her brother-in-law. When it comes time to fulfill her internship hours, she is shocked when her brother-in-law refuses to let her work for him. Dee finds that the only funeral director willing to help her out, is a man named Riddick, who runs the only African-American funeral home in town. The Undertaker's Wife is Dee Oliver. She is such an inspiration and a strong woman. She's plucky and someone who doesn't give up,Oliver is frequently funny, lightening the mood even when writing about her husband's death. She dispenses good advice towards pre-planning your own funeral and on the grieving process, both for someone who is in mourning, but also towards those who are interacting with people who have recently suffered a loss.